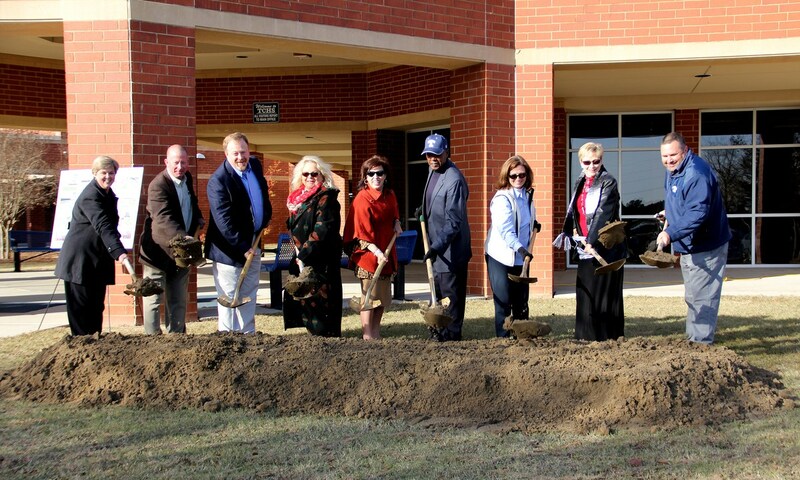 The Tift County Board of Education broke ground today on the expansion at Tift County High School. The $21.4 million project will add approximately 114,000 square feet to the existing high school. The addition is scheduled to be completed in the spring of 2018. Once completed the project will add 42 regular classrooms, four new science labs and an auxiliary gym. The Commons and office areas will be expanded to accommodate the additional students. The construction will add a healthcare science suite which will include five classrooms and two laboratories. One lab will be set up like hospital rooms while the second lab will be multipurpose for pharmacy, sports medicine and emergency responder pathways. The agriculture programs will also get two new classrooms and two new labs. The expansion will also allow for better space for the current cosmetology program and the beginning of new computer science, engineering design and AV production pathways. There will be equipment upgrades to match industry standards in mechatronics, metals/construction and business labs. The expansion project at the high school is the first piece in an overall grade reconfiguration for the system. Beginning in the 2018-19 school year, all current primary and elementary schools will become Pre-K –through fifth grade, Eighth Street Middle School and Northeast Campus will house sixth-eighth grades and Tift County High School will become a true high school for ninth – twelfth graders. Other general renovations will be done at the high school that are necessary for a 20-year-old building. Those will begin in late 2017 to be completed in the summer of 2018.